Washing and coating at the same time! “I want to keep my car clean but don’t have time to take care of my car”. If you are busy person we recommend “POWER FOAM”. Just washing with a foamed sponge by“POWER FOAM” applied onto it. You can wash and coat your car at the same time. If you are not sure how you should keep your car clean, please try it out. “I want to keep my car clean but don’t have time to take care of my car”. 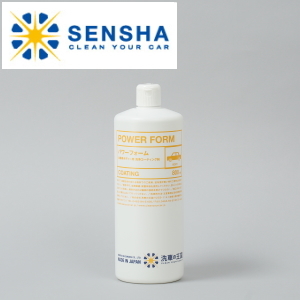 If you are busy person we recommend “POWER FOAM”. Just washing with a foamed sponge by“POWER FOAM” applied onto it. You can wash and coat your car at the same time. If you are not sure how you should keep your car clean, please try it out. New technology! Both cleaning and coating ingredients mixed in the same liquid!Once you use it, you will know how easy it is. This is by the latest technology! Washing and coating at the same time! Everyone does not ever have the experience in coating cars. “POWER FORM” creates very small bubbles to carefully clean your car without scratching. Rinse off the remaining bubbles by water. You will notice the car surface is already coated and waterproofed. Please wipe off remaining water. Our new coating technology will provide you with the special coating film and long lasting protection up to 3 months. If you use “POWER FORM” on a regular basis, small scratches will be less visible. To remove water stain, use “SCALE CLEAN”. We recommend using specially made spraying container called Form Gun for “Power Form”. Your work will be a lot easier.Pour “POWER FORM” into “Form Gun” then attach a horse at home water to the “Form Gun”. 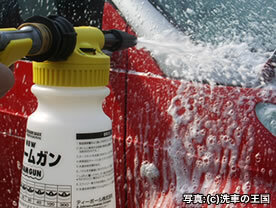 A lot of bubbles will be created and can be sprayed on the car easily and speedy. For more gentle washing, please use our “MOUTON GLOVES”using real sheep wool.